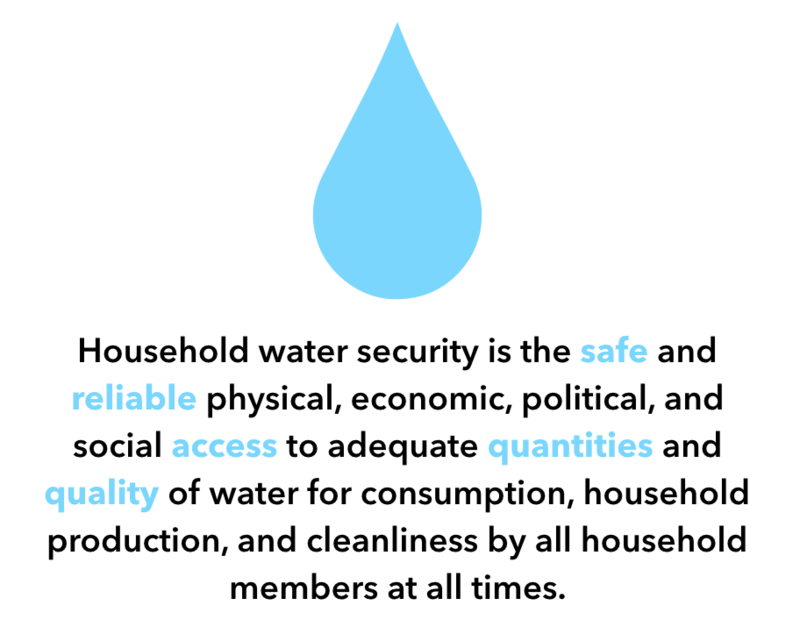 MANY FAMILIES DO NOT HAVE ACCESS TO..
Water (in)security is a complex, multifaceted topic. Each year, 4 billion people experience severe water scarcity for at least 1 month of the year. 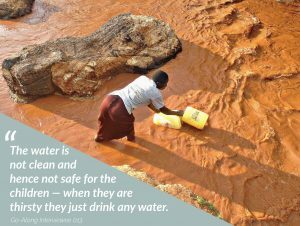 This issue is compounded by the fact that, worldwide, 663 million people lack access to an improved water source (and are at high risk for drinking contaminated water). 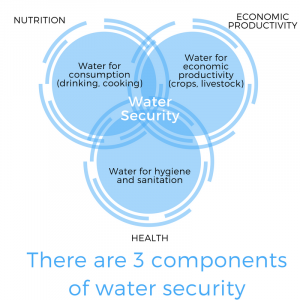 In an effort to better understand the underpinnings of this highly prevalent problem, our research team has developed a working definition of water security that seeks to capture the multi-dimensional aspects of water and its use. 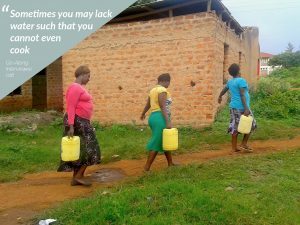 Water insecurity is when any dimension (quality, quantity, availability, accessibility) is not achieved. WATER INSECURITY IS AN ISSUE WORLDWIDE.. BUT THERE EXISTS NO WAY TO MEASURE IT..
Water insecurity is widely recognized as a burgeoning global health issue. Unfortunately, the extreme consequences of drought and water scarcity are projected to become more prevalent due to climate change – increasing water salinity, prolonged dry periods, poorer agricultural conditions. 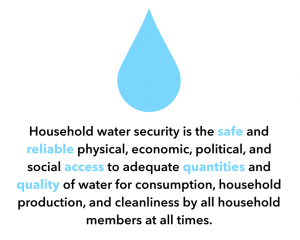 Despite this, the scientific community lacks the tools to meaningfully measure the issue of household water insecurity, a measurement that is necessary to identify high-risk communities for policy planning and program development. Kenyan women collect water for their households. Their experiences with water insecurity were documented in a previous study. A Kenyan mother fetching water for her household. As she notes, poor water quality affects all members within a household. 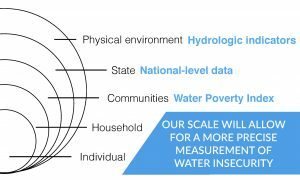 OUR MISSION: TO DEVELOP A CROSS-CULTURALLY VALIDATED..
A variety of data and indicators currently exist to capture water insecurity at the macro-level. However, no scales currently capture the unique experiences of water insecure individuals. 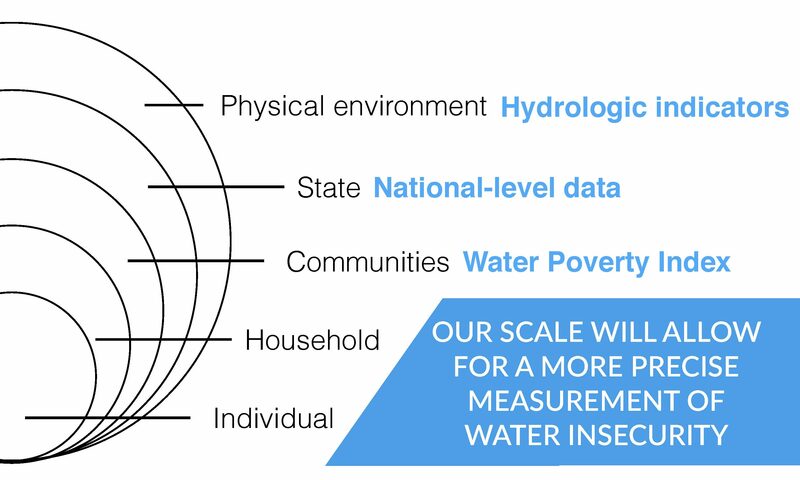 We hope to fill this gap by developing a cross-culturally validated scale that measures household water insecurity. This tool will enable scientists, program developers, and community leaders to determine the magnitude of water insecurity, to track its change over time, and to measure the effectiveness of various interventions. Scales that measure water insecurity exist mostly at the macro-level. No cross-culturally validated scales currently exist at the household or individual level.